And we’re her third owners. 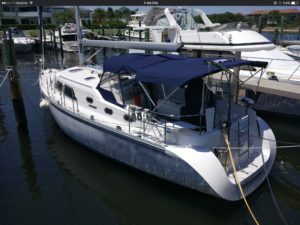 Originally sailed in the Great Lakes, she was formerly known as Island Time, and had been in Florida for about five years when we bought her in 2017. We will be sailing Vinyasa around the Chesapeake Bay for the next few years, and are looking forward to exploring other waters in 2021 and beyond.